SAN LUIS OBISPO, CA – AMETEK Sensors, Test and Calibration (STC) introduces the new, intrinsically safe HPC50 pressure calibrator. The new pressure calibrator is part of the company’s popular Crystal line of pressure products and offers time-saving features, like scaling, percent error and flow calculations, as well as internal and external pressure modules into a single handheld unit. The updated “advanced simplicity” interface also makes the instrument easy to use without sacrificing features. The HPC50 pressure calibrator uses a similar non-menu interface to the one found in the popular HPC40 series calibrator. This easy-to-use, single-layer interface has no deep menu structure, allowing users to quickly and intuitively perform tasks. Intelligent memory slots allow storage of up to five screens, simplifying the recall of previously stored settings and user setups. The calibrator offers deadweight tester accuracy along with a host of user-friendly features that deliver laboratory accuracy to an on-site, field usable instrument. The versatile HPC50 is suitable for calibrating pressure ranging from vacuum to 15,000 psi / 1000 bar with accuracy up to 0.035% of reading. It is ideal for process control applications, such as verification or calibration of pressure gauges, transducers, transmitters, pressure switches, and safety valves. Units are available in single and dual pressure models. Users can equip each with one or two new, intrinsically safe external pressure or temperature modules. In addition to the HPC50, AMETEK STC also introduces new APMi pressure modules, which provide the flexibility to read up to four pressure inputs with a single device, allowing users to either expand the range of their HPC50, view all four pressures simultaneously, or to read two different differential pressures. Alternatively, users can connect the HPC50 with two new ATMi intrinsically safe temperature modules, which AMETEK STC is introducing at the same time. These modules provide the flexibility to read pressure using the installed modules and, at the same time, read both static and ambient temperatures. All parameters on the HPC50 series are fully temperature compensated from -20 to 50°C, enabling it to deliver the same accuracy whether measuring pressure, current, voltage, or temperature. The HPC50 is the perfect instrument for the oil and gas industry because of its intrinsically safe ratings, expanded pressure ranges, and versatility. Some of the most common applications include maintenance and troubleshooting of gauges, switches, transmitters, transducers, valves, gas meters, flow computers, pumps, and filters. 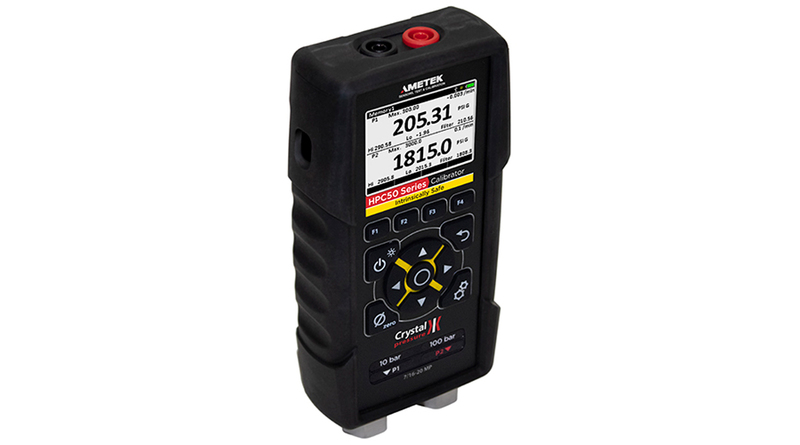 It can also replace a deadweight tester with a single handheld unit. AMETEK STC (Sensors, Test, & Calibration) is among the world’s leading manufacturers of calibration instruments for temperature, pressure, and process signals. For more information on the full line of Jofra and Crystal Engineering calibration products visit https://www.ametekcalibration.com/.